If you've seen the first episode of The Flash, then you know there's a shot of a newspaper with a nod to the sister-show Arrow in it. What you did not notice was that the actual text of that article had nothing to do Oliver Queen. It was actually lifted from an io9 article. 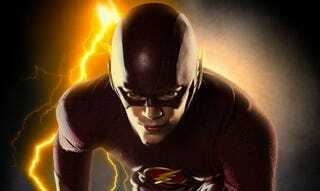 Warning, spoilers for the final scene of The Flash's pilot ahead. One of the ways that radiation causes illness is by damaging our DNA. University of Wisconsin-Madison biochemist Michael Cox and his team wanted to find out whether they could breed the common bacteria E. coli to be more resistant to radiation damage. So they took a group of E. coli, bombarded it with radiation until 99 percent of the microbes were dead, and then bred a new generation from the survivors. After 20 rounds of this, they wound up with a group of E. coli that could repair radiation damage after being blasted with ionizing radiation that was four orders of magnitude greater than what their ancestors could endure. In a new study, published earlier this month in the journal eLife, Cox and his team analyzed the 69 known mutations that allowed these E. coli to be so good at repairing themselves after intensive radiation bombardment. Our bodies repair DNA in many of the same ways that bacteria does. So this study sheds light on ways that human cells could one day repair radiation damage too. Said Cox in a release, "What our work shows is that the [DNA] repair systems can adapt and those adaptations contribute a lot to radiation resistance." It seems that Cox and his team's E. coli are actively repairing their DNA in the wake of radiation damage. But of course, there are a lot of unknowns here. "This extreme resistance we're looking at is a complicated phenotype," added Cox. "There are likely additional mechanisms buried in this data and we're working to pull those out." That's a very unusual merger they've worked out in 2024.